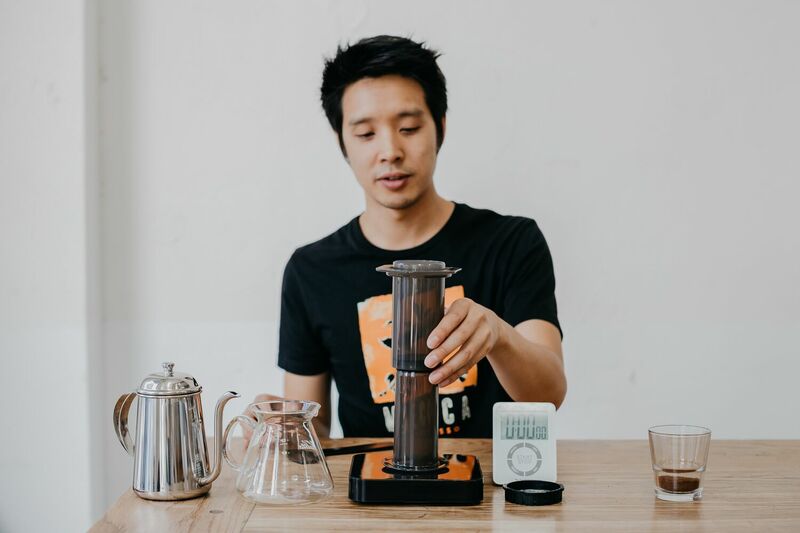 Join Junji Tai, Mecca Coffee’s trainer and warehouse manager, for a comprehensive guide to one of the simplest and most popular brew methods at home. Not many things in the world are as lighthearted and charming as a frisbee. A frisbee is a simple piece of plastic that anyone can pick up and have a quick go with, but offers long-term enjoyment to those who want to master the skill. Perhaps this was the motivation that steered Alan Adler to invent a simple, approachable and lighthearted new coffee brewing method in 2005 with the Aeropress. With only minimal product updates since its release, the Aeropress is now the go-to brew method for hikers, office workers, travellers and baristas alike, and for good reason. It’s durable, simple, consistent, and offers the user just enough room for personal flair that you can feel like a master barista when you nail a home brew. Whole bean coffee, within 2-4 weeks of roast date. Before you start – Flavour Goals! The magic of the Aeropress is in its ability to make a lightning fast espresso-style brew or a long gentle cup more reminiscent of a pour-over or French press. We recommend a filter-style brew when using our single lot coffees, and the below recipe will give you just that. Keep in mind that specific flavour categories and specific brew recipes for each coffee can be found on their info cards, and will guide you in finding your ideal coffee! Do you feel like something Light & Floral, Rich & Comforting, or maybe even Wild & Funky? 12g Coffee, ground to medium-coarse. Look for consistent coffee particle size similar to Milo. Carefully centre the paper filter over the lid, and wet with a small amount of water. The goal is to ensure all holes are evenly ‘sealed’ by the paper filter. Open up the aeropress so that the plunger is only 1cm into the chamber. Stand it up on its end on the scales, pour in coffee and tare the scales. Start the timer! Pour 200g water into the chamber. After 1:30, stir the coffee with the paddle. Screw on the lid, and using a hand on each half of the aeropress, invert onto the top of the carafe. Transfer into a mug, and clean the aeropress immediately. Enjoy! Consider using a better quality grinder. Inconsistently sized particles of coffee will lead to uneven extraction. And that’s just not fun at all. Brewing this way every morning, we think, will get you heading in the direction. All the equipment and coffee can be found on our webstore, or if you feel like popping in for a coffee and a chat you can find us here. Cam, Junji & The Mecca mates.